If Crow legends could be measured by degrees of credibility, then the story of Chief Black Foot staggers the imagination. All Native Americans share one thing in common: a veneration of their ancestors which most Whites don’t understand. Sometimes it is with grandfather tales or stories told by tribal historians. Sometimes it is with prophecies or the spiritual visions of tribal shamans. Sometimes it is with legends, like the story of Chief Black Foot, a legendary ghost story if ever there was one. It begins about 1795 with the birth of Kam-Ne-But-Sa in the Absaroka Mountains of the western Bighorn Basin, at a time when there were no white men present. His mother’s name was Strikes Plenty Men, and in Crow tradition, he belonged to her clan, the Sorelips. He had one brother named Busy Wolf. There may have been others, but since tradition also dictated that all his male relatives were also his brothers, sorting them out at this late date might be impossible. From his uncles and cousins, he learned the basics of warriorhood. At the time of Kam-Ne-But-Sa’s birth, the Crow Nation was divided into three main groups: the River Crow, known as the Dung-On-The-River-Banks, who roamed along the Yellowstone as far as the Missouri confluence; the Main Body of the Mountain Crow, who were called Where-The-Many-Lodges-Are; and another group of Mountain Crow called the Kicked-In-Their-Bellies, who spent the winters in the Wind River region of the Wyoming Shoshone and who rejoined the Main Body every spring. Historians tend to lump the two bands of Mountain Crow into one group, making the Mountain Crow and River Crow the two major subdivisions of the tribe. Politically, the River Crow and the Mountain Crow were two distinct bands, and legends tell of tragic clan feuds, but basically they were never hostile to each other. Kam-Ne-But-Sa’s group was the River Crow, and he grew up hunting the abundant game of the Yellowstone. By the time he was eighteen, he was well-skilled and able to provide for his own lodge. It is known that he had a daughter named Two Buffaloes and three sons named Big Snake, Goes Well-Known, and Cuts-a-Hole-in-It. Some historians claim he had other children, as he was married to at least four different women during his lifetime. Tribal historian Joseph Medicine Crow says Runs-Through-the-Camp may have been another son. By his Sioux wife, he may have had a daughter called Five, but since not much is known about his early life or his ascendancy to chief, no one is completely sure. As a young warrior, Kam-Ne-But-Sa’s main ambition was to achieve the status of chief, and competition was extremely keen. Only warriors with the most coups (feats of daring) were selected as leaders of the tribe, which meant Kam-Ne-But-Sa had to prove his bravery with many of the normal types of credible exploits. It was the foremost goal of every warrior, and the first one to do it achieved the highest coup status. Most chiefs could count ten or more of the various war honors. Little is known of Kam-Ne-But-Sa’s career as a warrior, but about 1840, in a fierce battle known as “Where Warriors Were Chased Back Into Camp,” located at a place now called Wyola, Montana, he earned two war coups at the same time. In a single, bloody, hand-to-hand combat with an enemy Sioux, he was the first to touch the enemy, and then wrestle his enemy’s weapon away from him. It was a mighty war victory for Kam-Ne-But-Sa, who would one day become the greatest chief the Crow Nation ever had. In a later exploit, Kam-Ne-But-Sa earned additional war coups by leading a Crow war party in pursuit of Piegans, who had just raided the Crow camp, stealing many Crow horses, including all his own. Chasing the enemy north into the Snowy Mountains near present-day Lewistown, Montana, Kam-Ne-But-Sa overtook the Piegans, subdued two enemy warriors and captured many horses, including his own. According to the traditions of Crow warfare, these two experiences vaulted Kam-Ne-But-Sa to the ranks of a mighty warrior, and he became a chief. His contemporaries were such great warrior chiefs as Iron Bull, also known as White Temple, Flat Belly, Old Dog, Medicine Crow, and Bear Wolf. A young warrior under his supervision was Aleek-Chea-Ahoosh, who was later to become Plenty Coups, last chief of the Crow Nation. As chief, Kam-Ne-But-Sa’s medicine was the white goose. He would wear the head and tail of a goose on his headdress decorated with two narrow pieces of red flannel, which streamed back over his shoulders. Two broad pieces of flannel with many scalps attached passed around his neck and streamed down his back like a reverse stole. He was also an eagle shaman, and when not wearing his headdress, he wore a magnificent eagle feather entwined in his hair. At well over six feet tall, he was an imposing figure of an invincible warrior. Chief Black Foot became a mighty peace chief. When the white man began the westward expansion into the Crow Nation’s ancestral lands, Black Foot dealt wisely with the United States and gained many advantages for his people. It was Black Foot who decreed, way ahead of his time, that all decisions for the people should be made by the people and not just by the chiefs. 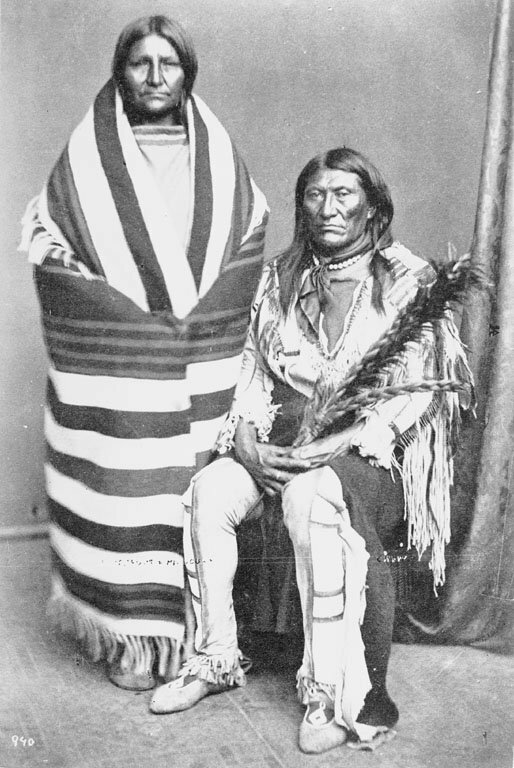 And, it was Black Foot who personally led the Indian delegation of lesser Crow chiefs, such as White Swan, Shot in the Jaw, Poor Elk, and Wolf Bow, to the important Fort Laramie treaty council of 1868. This treaty established a 38-million-acre country for the Crow Indian Reservation and included a provision that allowed the Crow to hunt on unoccupied federal lands, something that ensured Black Foot’s people prosperity when the great herds engaged in their annual migrations. Returning to his people after signing the Treaty, Black Foot said, “As long as there is one Crow Indian, he will have a place to come home to. The earth of the Reservation is your Mother…and she will shelter and protect you….” He couldn’t know how prophetic his words were to be. About one year after the big battle on the Little Big Horn, a small band of Crow went hunting. Their journey took them from the Yellowstone area to the Stinking River, now known as the Shoshone River, in what is now the state of Wyoming. The band reached the Stinking River a short distance below where Cody is now located. The men held a council, deciding the best places to hunt. Some of the other chiefs decided to follow the river into the mountains after the deer and bighorn sheep, while Black Foot and his Sioux wife (he also had a Crow wife at the same time) decided to hunt south in a little valley where the buffalo still roamed. It was the autumn of 1877, and the mighty chief was about eighty-two years old. Plain Feather, a tribal historian for the Crow, who died in 1970 at the age of 100, was a small boy at the time. His memoirs state that his family went with the group into the mountains to hunt the deer and bighorn sheep. They made camp at a fork in the river just above a narrow canyon where a dam is now located. At dusk on the second day of the hunt, two messengers arrived from the other camp with the news that Chief Black Foot and his wife, left, had suddenly become ill and died. It was believed they had died of pneumonia. Plain Feather’s band immediately struck their tepees and headed for the other camp. They arrived early the next morning in time for the burial. The bodies of Chief Black Foot and his wife, strapped in robes, were taken to the rimrocks of the valley and put into a ledge. They were then covered over with rocks. The hunting expedition was called off, and everyone returned to the Yellowstone, greatly saddened at the loss of their Chief-of-All-Chiefs. 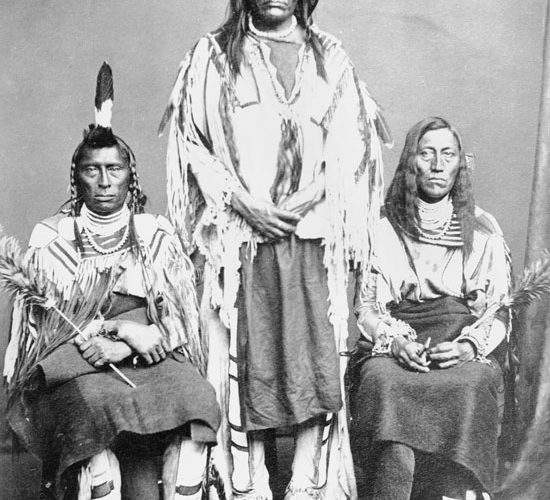 When the white man finally settled in the valley where Chief Black Foot lay buried, they called the river Meeteetse, which is a rough pronunciation of the Crow word Bachay-chay. It means “a good man” or chief. In subsequent trips to Cody, the Crow Indians would usually visit the grave site as a sacred shrine. Gradually, its exact location became lost, and no one knew where the great chief’s bones lay, despite the fact that the Crow Nation had been searching for them for more than 100 years. It caused the Crow great sadness that the remains of their Chief-of-All-Chiefs could not be found and returned to the reservation. It is also possible that because of their reverence for their great chief that the following strange events happened. In 1978, a psychic-healer from Virginia named Victoria Mauricio informed Crow leaders that the spirit of a Crow chief had been coming to her. She said his name was Black Foot, but no one on the Crow Reservation recognized the name. Victoria then spelled out the details. Black Foot first appeared to her in 1975, arousing her from deep slumber with the loud beating of drums. She awoke to find herself surrounded by Indians in full war paint, dancing and chanting and making threatening gestures, until a huge Indian nearly six feet, five inches in height, approached—brandishing a large tomahawk. He had coal black hair hanging nearly to his waist, which he wore braided and decorated with eagle feathers in the style of a mighty warrior. The tall warrior told Victoria not to be afraid, that he was “Black Foot of the Crow.” He then pointed to his tomahawk and told her it would be a sign between the two of them. A year later, Black Foot told Victoria to go to the “room of many books” where he wanted to show her something. “Look in the book of the Plains Indians. There you will find a picture of me. I shall be holding a tomahawk.” Pouring over books, Victoria finally found a picture of five Crow Indians. Black Foot, holding the same tomahawk she had seen the first night of their “meeting,” was the second from the left. When Victoria contacted the Crow leaders, she claimed that Black Foot came to her often, and that he wanted her to contact his people. Clara Whitehip of the Bureau of Indian Affairs then offered to check with the tribal historians. A few weeks later, Victoria received a message from Clara that Black Foot was, indeed, a very famous Crow leader. He was their Chief-of-All-Chiefs, and his Crow name was Sits-in-the-Middle-of-the-Land. Furthermore, the Crow had been searching for the great chief’s remains for more than 100 years. Would it be possible for Victoria to help the Nation find the well-hidden grave? Apparently, this is just what Black Foot intended. Victoria went to Crow Agency, Montana, in July of 1978. While preparing to attend the Sun Dance ceremony, Black Foot appeared and told her, “I want to be brought back to the reservation. I am in white man’s land, and I want to come home.” Black Foot then requested to speak to his people through her, and arrangements were made in the home of a medicine man named Francis Stewart. When Victoria went into her trance, witnesses said her face assumed the countenance of the great chief. They said her cheekbones got high, and a blue streak appeared from her mouth to her neck. Since it’s easy to be hoaxed at such situations, it was agreed beforehand that Black Foot’s presence would be determined by the “swaying and flaring up” of a candle, a candle no one could touch. When the great chief appeared, the candle swung violently from side to side and then flamed high in the air, all by itself. Black Foot told his people he wanted to come home, and then he told the medicine man using the Crow language, which Victoria did not speak or even understand, that the people would prosper. It sent chills through the Nation. There was a prophecy in Crow history more than a century old that promised a great chief would return, and “miracle” healings would come from an outsider. Before Victoria left for home, she conducted a series of healing sessions. She also mentioned to Joseph Medicine Crow that Black Foot had often said something that sounded like “Tse Tse.” It made no sense to her, but Medicine Crow was astounded. Across the Wyoming border was a small town called Meeteetse. It lay on the Graybull River just south of Cody. Through the years, the Crow Nation had searched around Cody for the great chief’s remains. Now, they would begin again at Meeteetse. 1. The searchers were to look for a pitchfork. 2. Seven white women would somehow enter the picture. 3. The hooting of an owl would be heard during the day. 4. Three odd-shaped rocks would be seen. 5. There would be a tree shaped like a pointing finger. 6. The ground would glisten. 7. The scratchings of an animal would be heard. Near Meeteetse, above the Greybull River, named for another great Crow chief, and one hundred miles south of Billings, Montana, the clues fell into place. Everything conformed with the description of the site Crow elders once visited. At the Pitchfork Ranch, owned by a woman with seven female heirs, the searchers heard an owl hooting during the day. They knew they were close. They called Victoria. She told them to enter the gate and head toward the highest ridge in the area. She said they would find three rocks projecting upward and outward near a large pine tree, which would be to the right of an entrance to a cave. She further said that as they got near to where the chief was lying, they would hear scratching sounds, and there would be a glitter when the light hit the rock. The searchers found everything just as Victoria said they would, but darkness fell before they found the sacred site. Then something truly amazing happened. One of the Crow searchers saw “what looked like a person” disappear behind a pine tree, move toward a rock, and then vanish. Using a flashlight, the searchers investigated. The beam of the light hit the rock, and the whole area glittered. The search was over. Near the east wall of the cave, a human arm bone protruded from the floor. The searchers found, half buried in the sand, the skeleton of a very large man. It was surrounded by black, white, and blue beads—all the trappings of a great chief laid to rest. Archaeological experts said the skeleton had to belong to Chief Black Foot, that it couldn’t possibly belong to anyone else. The wear on the teeth indicated an old man, and the length of the bones showed he was very tall. Black Foot was in his eighties when he died and six feet, five inches tall. Also, the beads found with the remains were made before 1850 and were of an extremely valuable-type crystal worn only by great chiefs. The skeletal remains were carefully packed and brought back to Crow Agency, Montana. Black Foot, at his own request, was laid to rest on 4 October 1978, close to the Bureau of Indian Affairs Office near the Crow Reservation. During the ceremony a large bald eagle flew overhead at treetop level, screamed, and flew off when the ceremony ended. To the Crow, it was a sign that Black Foot was present. The great chief always wore the largest eagle feather in his hair, and its knowledge was legendary. The psychic incident has been well-documented. When Victoria’s story became known in 1978, NBC television filmed it; the television program “That’s Incredible” did two segments on it; Fate Magazine did a cover story on it; National Enquirer ran a large feature; and scores of other newspapers and radio stations, large and small, covered it extensively. Victoria, herself, wrote a book on it. But what was not reported is what happened afterwards. A local television station wanted to interview Victoria, and arrangements were made to do the filming at a friend’s house. When the television crew arrived, none of the expensive equipment worked. There was no picture, and the recorder was unresponsive. So, the crew packed up their equipment and left, setting another date for the filming. When it came time for the next appointment, the television crew brought a lot of backup equipment. Again, nothing worked, although everything had worked fine before they had left the studio. The equipment was taken directly to a repair shop, and everything worked fine. Nothing could be found to explain the malfunction. A third appointment was made, and this time, the television crew borrowed the equipment. They plugged it in and had trouble with it. At this point, the totally frustrated producer asked Victoria to go into the kitchen and make some coffee, while the technicians tried to figure out the problem. The cameraman in question was Phillip Armstrong McCutchen, and he looked exactly like Custer’s pictures, yellow hair and all. After explaining to Black Foot that McCutchen was merely a family descendent and not Yellow Hair, everything worked smoothly without further incident. READ 2007: Skinwalkers - What Are They?